THE BOOK CLIFFS, Uintah County — Environmental activists chained themselves to heavy equipment Monday to protest improvements to a road they say will open Utah's rugged Book Cliffs area to tar sands and oil shale development. The protesters also held banners decrying plans by U.S. Oil Sands to develop the nation's first commercial tar sands mine near PR Springs on the border of Grand and Uintah counties. "We're here today as climate justice organizers to protect the land and the water system from companies like U.S. Oil Sands as well as any other interests that might try to develop the oil shale and tar sands reserves on this land," said protester Lauren Wood, who described herself as "a third-generation river runner and a seventh-generation Utahn." Protesters from groups like Rising Tide Canyon Country and Peaceful Uprising held a Native American water blessing early Monday at the proposed mine site with members of indigenous tribes from the Four Corners region. They also claimed, in a press release, that they continued to stop work at the mine throughout the day. U.S. Oil Sands CEO Cameron Todd, however, said the company has no operations at the mine. Construction isn't slated to begin until next year, he said, though "No Trespassing" signs have been posted to keep the public out of a potentially dangerous area. "Our primary concern in the region right now is public safety," Todd said. "We encourage people to respect private property rights and to be safe." The chief executive added that he "believes in people's free speech rights" and doesn't believe his company has any reason to be in conflict with anyone because its processes are based on "sound science." U.S. Oil Sands has 32,005 acres under lease in the Uintah Basin for the potential extraction of bitumen, a thick, tar-like substance that can be refined into oil. An initial site of 213 acres is planned for active mining operations that could begin by late next year. "We believe the development of our operation happened with good involvement from the public and government," Todd said, adding that the company met all the permitting requirements set forth by state and federal agencies. The state Division of Water Quality, in issuing a permit for the proposed mine, determined it will have minimal impact to potential groundwater in the area. The reasoning was based on evidence that shows a lack of groundwater resources in the project area, according to the division, as well as the manner of the mine's operation, such as the exclusion of tailings ponds. Wood and others don't believe those requirements go far enough though. "We are looking at a project that's taking place on top of the drainage system that will eventually make it into the Green and then the Colorado River drainage," Wood said. "The last thing we want to do is give people oil instead of water." 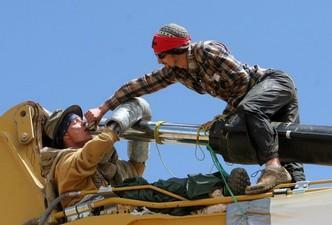 U.S. Oil Sands wasn't the only target for protesters Monday. They also stopped construction of the Seep Ridge Road, a project that went through years of environmental study by the Bureau of Land Management before it began. We're here today as climate justice organizers to protect the land and the water system from companies like U.S. Oil Sands as well as any other interests that might try to develop the oil shale and tar sands reserves on this land. Once a rocky road linking Uintah and Grand counties through the Book Cliffs, the Seep Ridge Road is now being improved. Part of that improvement involves paving 46 miles of the road, which concerns Salt Lake County resident Renae Widdison. "This road right here is opening a huge swath of land, destroying a huge swath of land to open this area up to oil shale and tar sands development," said Widdison, who was chained together with another protestor to a massive piece of construction equipment Monday. "I'm just not going to let that happen," Widdison said. Uintah County sheriff's deputies spoke with road construction bosses and U.S. Oil Sands representatives, as well as protesters Monday. They did not make any arrests. "Our course of action was more to observe what was going on and make sure nothing got out of hand," Uintah County Attorney G. Mark Thomas said. The county attorney said there have been protests near the proposed mine site in the past, but until Monday no one had interfered with the work being done in the area. Arrests could be made in the future, Thomas said, depending on what protestors do. That's a risk Widdison is willing to accept. "I think people who enact civil disobedience, their causes should be understood," she said. "And it should be a practice that we take to stand up to injustice."